There are times to stop counting calories and, today, I am going to share one of mine. My family went berry picking and managed to pick literally a million blueberries (or some big number). I LOVE blueberries and for $2.50 per pound, I couldn’t stop picking them. We froze many of our “catch” but I kept dreaming of a blueberry dessert that would use as many blueberries as possible. No, not blueberry pie (do I look like my pastry crust is perfection?) 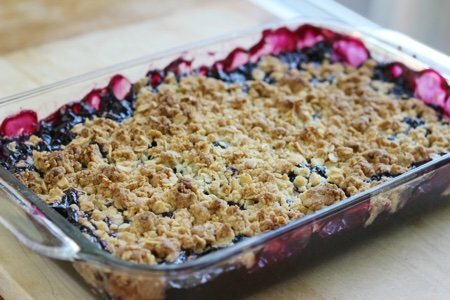 but blueberry crisp (can’t go wrong). You need 6 cups of blueberries which is why this is a special treat because most of us aren’t swimming in them. I was doing the backstroke through mine and couldn’t wait to cook them into a perfect dessert. This dessert uses butter, white flour, and sugar and I simply don’t want to change it. Yes, I am sure I could “healthify” it but some recipes shouldn’t be messed with. I am not even going to include the nutrition facts because I DON’T CARE. It is too wonderful to analyze. Smell the crisp baking, spoon it slowly in your mouth and remember for a minute that heaven is on earth. It can be found on a blueberry bush. What is your favorite thrilling recipe? Preheat oven to 375 degrees. 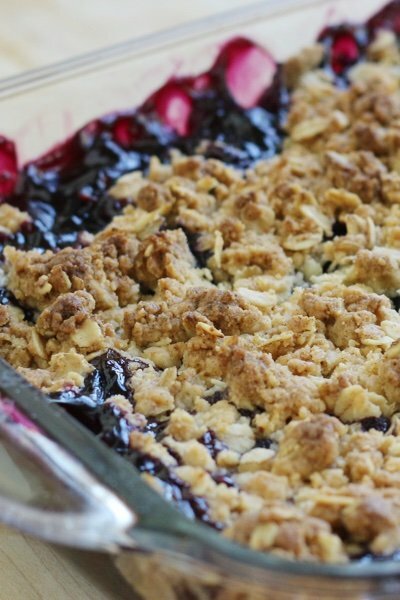 Mix blueberries, sugar, cornstarch, and salt in a large bowl and put in a 9x13 inch casserole. Cream sugar and butter together. Mix flour, oats, baking powder and salt in a small bowl. Mix butter mixture and flour mixture together until topping forms clumps. Sprinkle topping over the blueberries and bake for 1 hour until topping is golden brown. Enjoy, hot, cold, or room temperature. YUM...I am making this RIGHT NOW! sounds divine and even better, the pricing for the blueberries ... much easier to pick than strawberries and less dangerous than raspberries LOL. You're getting lots of fiber and fruit goodness so the modest amount of other REAL ingredients wouldn't worry me in the least. I make a jam-like blueberry concoction that is delish on ice cream, greek yogurt, toast, etc. Keeps well in the fridge. Just made a big container of strawberry rhubarb that I use in the same way. 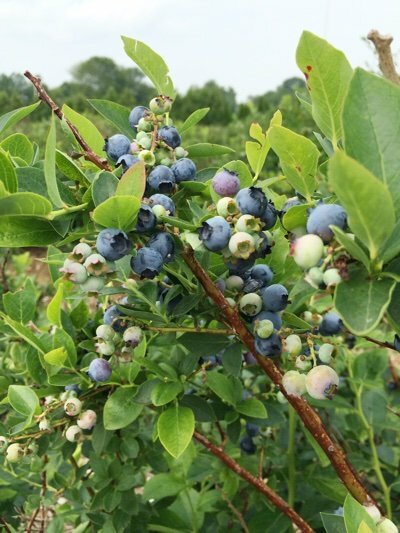 Enjoy your blueberries! This will be sooo yummy warm. AND is worh turning the oven on for in the summer. wow, thank you for posting this, AND for not posting the nutritional info. Sometimes, we just need to enjoy food like this. Not every day, but now and then. I make this same topping except I use whole wheat flour and nobody knows the difference except me! I'm ready to devour that! This recipe sounds wonderful, Lisa! You are so funny and down to earth! I love your blogs! You know I'm all about letting go and having treats every once in a while!! I am though totally going to try this using my new low carb tricks only because I've been doing so well and I don't want to blow it! Thanks for the base recipe! One of my favorite thrilling recipes with blueberries is Blueberry Kugen. This recipe was handed down from a sweet elderly woman I worked with in the 80's, from her German mother. Its a real keeper! Mix 1C flour, salt, 2T sugar, cut in butter til crumbly. Sprinkle vinegar, form dough, with floured fingers, pat into 9'' spring-form cake pan, 1/4'' thick on bottom, up sides about 1'' but a bit thinner. Add 3C blueberries evenly to pan. Mix remaining 2T flour with remaining 2/3C sugar and cinnamon. Sprinkle over blueberries. Bake on lowest rack in preheated 400degree oven 50-60 minutes until crust is browned and filling is bubbly. Remove from oven and sprinkle evenly with remaining 2C fresh blueberries. Cool, remove sides of pan and I put it on a pedestal and wait for raves. Makes 8 servings. Lisa, can this be made ahead and frozen? ?